As is the British way, most of this part of England is heavily skiving or otherwise having fun today and blaming it on what nowadays is called a “weather event”. Why should I miss out? 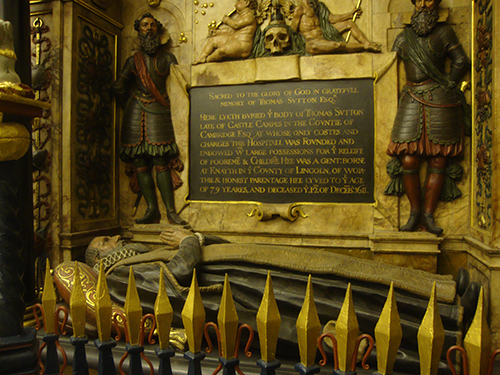 This frivilous post has nothing to do with London, but does with history. Sort of. So please indulge me, or just skip this post. 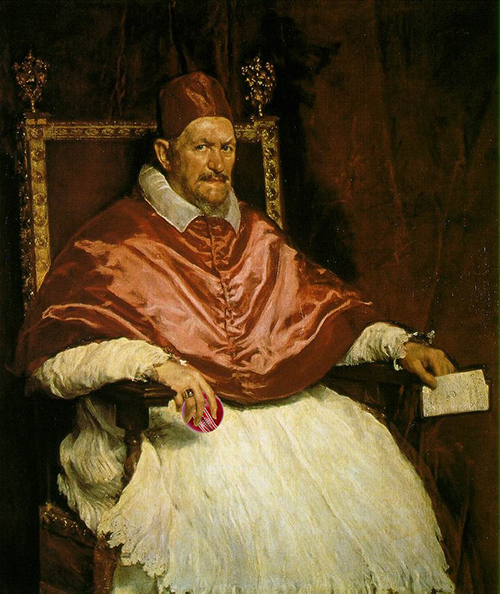 Pope Innocent X by Velazquez (1650). Last week we heard on the news that the Vatican has started its own cricket team. Fondly recalling my undergraduate days at Royal Holloway it got me to thinking about my perfect Vatican XI. Deeply ensconced as I once was in Medieval Europe, the Crusades etc, some popes of note loomed large. Here goes. 1 Leo I (440 – 461) – Turned Attila and his Huns back at the very gates of Rome. Who better to open the batting? 2 John Paul II (1978 – 2005) – Steady bat, long time at the crease. Crowd-pleasing. 3 Gregory VII – (1073 – 1085) Hildebrand. Fearless, gregarious, extroverted. After a period or papal vulnerability, stamped the church’s authority over the Holy Roman empire in the person of the emperor Henry IV. Perfect for Number 3. 4 Adrian IV (772 – 795) (c) – as the only English pope, has to be skipper. Also 24 years in the middle a cracking innings for those times. Near contemporaries, these highly cultured gentlemen were the first of the humanist popes who sponsored the rivival of ancient art, architecture and philosophy. So very stylish with bat in hand, though always vulnerable, not unlike David Gower, one imagines. Nicholas was in post when Constantinople finally fell to the Turks. Lacked the authority to do anything about it. Not a pope but one of the leading theologians in church history. And smart, despite his nickname of Dumb Ox, owing to his bulk. So a large and deceptively nimble presence behind the stumps. And just the chap to come in after a bit of a middle-order collapse. Pace attack. These three no-nonsense, aggressive pontiffs perfect to keep the opposition on the back foot. Led by Julius II, “the warrior pope”, he spent most of his reign pillaging Italy at the head of his mercenary troops. Constantly at war too with Michelangelo whom he got to paint the Sistine chapel. Innocent X. Check the Velazquez portrait (above), that’s all you need to know. Urban VIII. Patron of Bernini and scourge of Galileo. Famously melted priceless bronze decorations to make cannons. Over 20 years in the job so good man to wag the tail when needed. 11 Alexander VI (1492 – 1503) The Borgia pope, avaricious, sneaky, tricky, full of guile and deception, but enjoyed his fun too. Perfect spin bowler attributes. Scorer: Girolamo Savonarola (1452 – 1498) Not a pope, but a firebrand Dominican preacher who held both religious and laity to account for slack moral practices – usuary, sumptuary, gambling, promiscuity, etc. Inspirational and popular till the fun-loving Florentines got bored with his puritanism and burned him in the town square. But good at keeping score, one imagines. So there you have it. If I were back at boarding school playing pencil cricket instead of doing prep, this would be – in my opinion – a formidible Vatican XI. Hat-tip to LH Member Deborah Metters @rosamundi for egging on this tomfoolery. Guest Post. On the 10th anniversary of Concorde’s final commercial flight, David Long muses on the magic of our magnificent, lost Speedbird. “I’ve flown Concorde.” Actually I’ve flown in a Spitfire – a rare two-seater, which is much more unusual – but somehow people relate more to the Concorde experience and even now, 10 years after this shimmering white exemplar of Anglo-French cooperation was canned, those few brief words will still bring a conversation to a sudden green-eyed halt. For years, right until the very end, its unmistakable profile coming into Heathrow still made people look up – not just tourists, but Londoners too who must have seen it nearly every day – and as a child I remember the conductor at an outdoor concert at Kenwood or maybe Crystal Palace stopping the performance mid-symphony and gesturing for the orchestra to stand and applaud as the magnificent creation passed over. 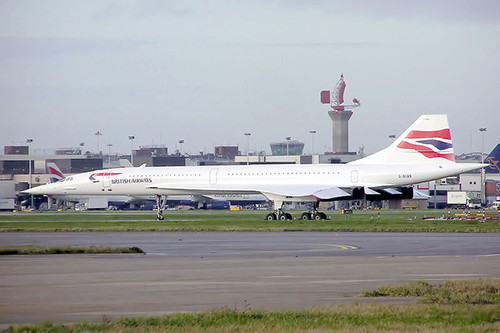 Even people with no interest in aircraft loved Concorde, and in the face of the dreadful disaster in Paris, the far-reaching effects of 9/11, and a growing environmental awareness, most wanted it to continue flying even though for the overwhelming majority the chance of ever climbing aboard was never more than zero. That left only Concorde. Not that it ever made much sense either, financially, although mentioning this now seems vulgar and in decidedly poor taste. Some things, we like to think, are simply above price although there’s no escaping the reality that the original budget of £150 million reached something like two billion of public money before the ‘planes were sold to what is now BA for a mere £1 apiece. But then there are so many ways in which Concorde made little sense. That graceful, slim shape, for example, meant it was far more cramped than even the cheapest charter. (And this despite the fact that, in flight, it stretched by nearly 10 inches as its surface temperature rises to 100°C+) It was also a good deal noisier than conventional aircraft. Inside, I mean. From outside it was in a whole new league altogether with a signature sonic boom that would have shattered windows more than 60 miles away had it ever broken the sound barrier over land. And as for the fuel consumption of its four gigantic Rolls-Royce Olympus 593 engines, famously the most powerful jet engines in commercial service? 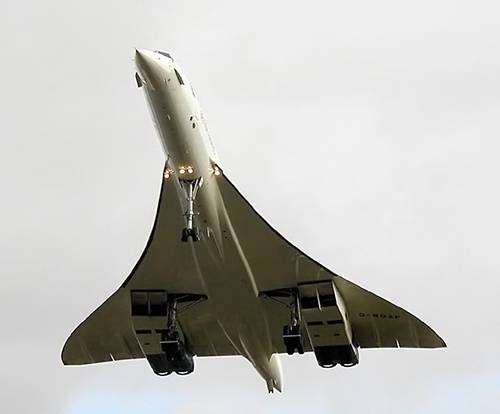 Well, let’s just say that given that they were already slurping 5,638 gallons an hour in the early 1970s – when OPEC started holding the world to ransom with increased prices for crude oil – the ability to fly at twice the speed of sound wasn’t the only miraculous thing about Concorde’s continued existence. But balancing all of this, and flying at an apparently effortless 1,340mph, few then or now could deny that Concorde was beautiful. Really, really breathtakingly beautiful. It was also, inarguably, such a technological tour de force – the result of more than five million test-flight miles, much of it at Mach speeds – that it quickly came to symbolise European technical achievement and pride in a way which today – post-Dome, post-Eurotunnel, and in the midst of Crossrail – is impossible to imagine. The authorities weren’t blind to its symbolic value either, and when the US finally cleared Concorde to land in America two were sent over, carefully timed to land simultaneously and to taxi up to the terminal in a perfectly orchestrated delta-winged ballet of elegant, nose-drooping, synchronous showing-off. From then on passengers on both sides of the Atlantic welcomed the chance to slice hours off their journeys: London to New York took less than three and a half hours, roughly half the normal time and surprisingly only 20 minutes more than if Boeing’s rival SST had made it to Mach 3. 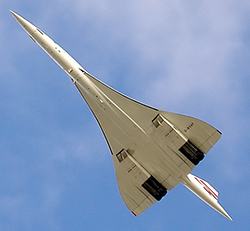 But, while not quite just a rich man’s toy, the example of Concorde certainly demonstrated that supersonic travel was never going to be for the masses – or at least not any time soon. To such people the time saved was clearly worth the money: the five-hour time difference between the UK and US meant in effect they arrived before they had taken off. But to those down on the ground it is, even now, much harder to say quite what Concorde represented or why 10 years on its loss is still keenly felt. But perhaps some things are never meant fully to be understood, and the truth might just be that Concorde really was that special. London HIstorians member David Long is a journalist and author of many books, mostly relating to London and its history. His latest – Bizarre London – has just been published. On this blog, see also. Guest post by LH Member Jane Young. G I Brides is an account four of young women who married American servicemen and what became of them. The narrative takes you through London in the Blitz, war torn England then across the Atlantic and back again. Beautifully written, it manages to seamlessly combine oral history with well-researched social history. The retelling of the excitement, romance, fears and hardships the G I brides experienced is engaging throughout. Commencing with life during the Second World War, it goes on to depict poverty; housing conditions; alcoholism; gambling addiction; domestic violence; and single parenthood in post war society. The journeys of four very courageous women, to the United States and through life are described with pathos whilst remaining refreshingly devoid of unnecessary drama or resorting to rose-tinted nostalgia. Gwendolyn, Rae, Margaret and Sylvia are just four of the 70,000 British women who undertook a life-changing move to another country during a time of turmoil. Their stories are probably no more or less extraordinary than many of the other G I brides, but nonetheless remarkable they certainly are. The difficulties they encountered are described with honesty and humour alongside meticulous attention to detail which accurately illustrates the backdrop of everyday day life during wartime and the post-war era. An immensely readable history of real people and the life they encountered, a fascinating rendition which culminates in a poignant explanation for the inspiration behind telling their story. 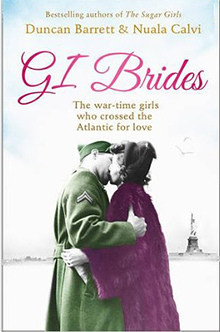 GI Brides by Duncan Barrett and Nuala Calvi is published by HarperCollins with a cover price of £7.99 although it is available for less. By the same authors: The Sugar Girls – our review. A guest post by Mathew Lyons, author of The Favourite. Those whose interest lies outside the Tudor era could be forgiven for exasperation at the extent to which the long sixteenth century still dominates our nation’s cultural life. But the new exhibition at the National Portrait Gallery – Elizabeth I and Her People, which runs until January 5 2014 – is nevertheless good enough to excite the curiosity of even the most stubborn Tudor-phobe; and for those of us who find the period particularly fascinating, it is a delight. The exhibition has been curated by Dr Tarnya Cooper, both chief curator and 16th-Century curator at the gallery. She is the author of the recent Citizen Portrait – Portrait Painting and the Urban Elite of Tudor and Jacobean England and Wales, 1540-1620, and her interest in the representation of lives outside the courtly elite is evidenced throughout. Late Tudor England grew into an economic powerhouse, based on a flourishing mercantile culture, the increasing financial heft of the City of London and the political and religious stability – relatively speaking – of the Elizabethan state. And this middling sort, aspiring, ambitious, self-conscious, are superbly represented here. This popular Tudor painting kicks off the show. 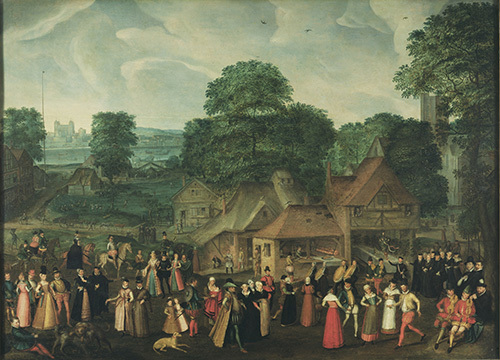 A fête at Bermondsey by Hoefnagel, c1570. Permission of the Marquess of Salisbury. A trio of portraits, for instance, reveals the Wittewronghele, family – father, mother and son – who established a prosperous brewing business in the capital. Thomas Gresham – arguably the most brilliant financier of the 16th century – is here. We see, too, the court portraitist George Gower, who chooses to be painted holding the tools of his trade – the brush and palette – rather than with something that might represent a claim on family title or another, more obviously self-aggrandising, social status. The times were changing. Trade itself was becoming respectable. But beyond the portraiture, we also see something of the texture of people’s lives. There is some wonderful Tudor clothing here, from a seaman’s cloak to a superbly detailed woman’s waistcoat. And there is much, much more: a tankard inscribed with ‘Think and Thank’, surely the 16-century equivalent of ‘Keep Calm and Carry On’; a pristine set of drawing instruments; pins, without which many Tudor garments were simply unwearable; an intricately carved ivory comb featuring the Judgement of Paris and David’s message to Bathsheba; and so on. 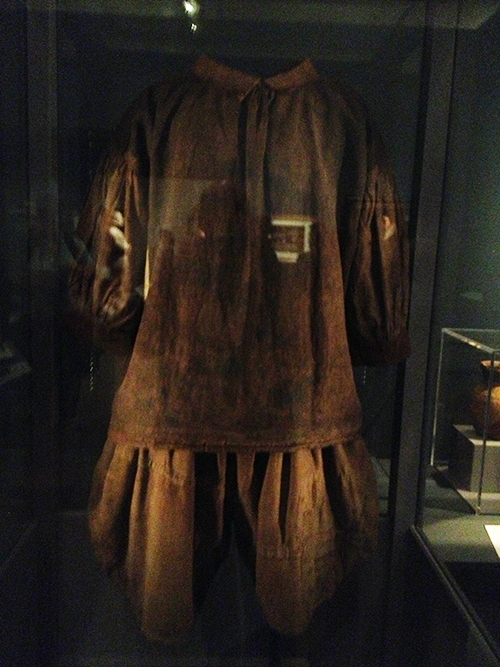 Seaman’s smock. A very rare survival. Museum of London. 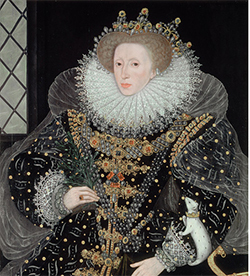 For many, perhaps, the portraits will still be the point, and one room is given over to those of Elizabeth herself, including Hilliard’s sumptuous ‘Ermine’ Portrait. 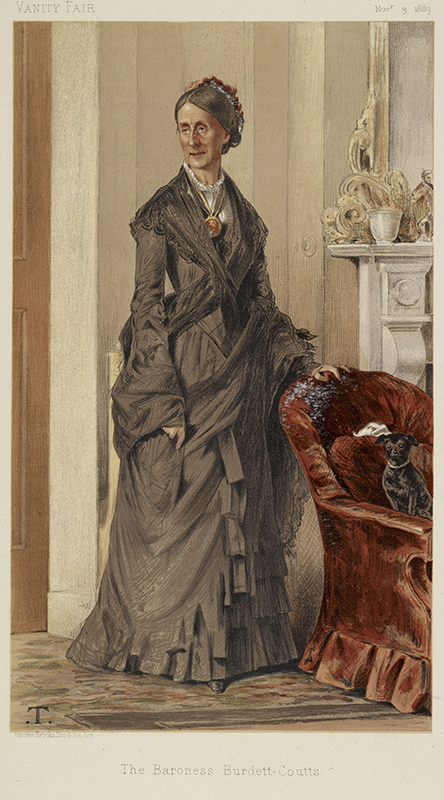 Even here, though, the exhibition is careful to delineate between the kind of representations that would have been available to the different strata of society, from the full length paintings that hung in noble houses, through the more modest copies owned by members of the gentry, down to the portraits that every person in the country had access to. When Elizabeth I recalled the coinage early in her reign, she became the first English monarch to sit for the image that represented her on her currency: it was a powerful statement of intent. 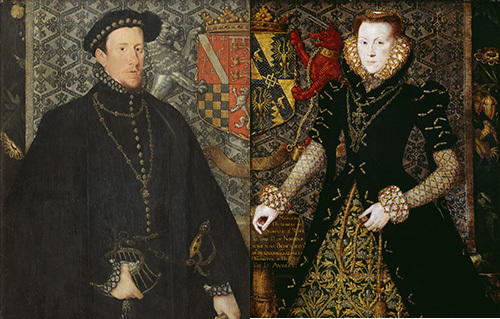 Thomas Howard, Duke of Norfolk (private collection), Margaret Dudley, Duchess of Norfolk (English Heritage), both by Hans Eworth, 1562, reunited for the first time in decades. There is, too, a room of portraits of courtiers and nobleman. Again, however, the exhibition goes beyond representations of mere power, to offer a more unconventional and human perspective on the way portraiture embodied a kind of power – but also a negotiation with it. Elizabeth Vernon, Countess of Southampton, appears in – in context – a shockingly private portrait of herself in a bedgown beside her dressing table. She had been one of Elizabeth’s maids of honour and her marriage to Shakespeare’s patron, Henry Wriothesley, the year before had caused controversy at court resulting in her banishment. 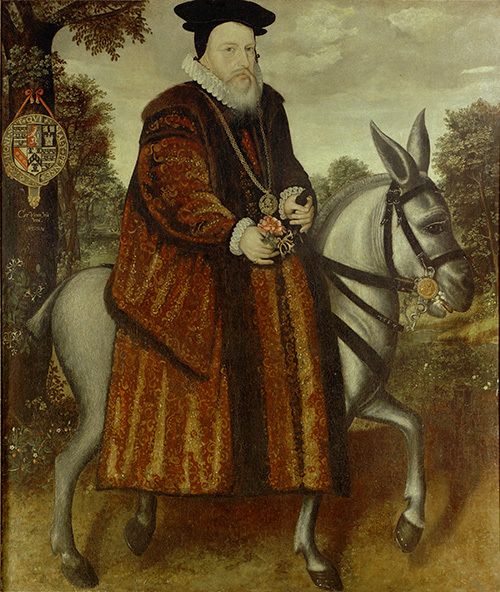 William Cecil, Lord Burghley, whose ward Wriothesley had been, had wanted him to marry his own daughter. He is pictured here, mostly likely in his lost palace at Theobalds in Essex, somewhat charmingly athwart a donkey among some strawberry plants, as if to plead with his queen for the quiet pleasure of a country life away from the explosive tensions and rivalries of the court. 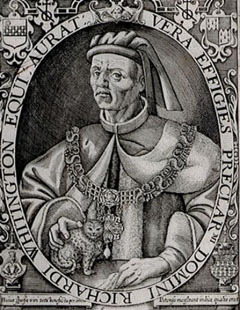 William Cecil, Lord Burleigh. Unknown artist, The Bodleian Libraries. 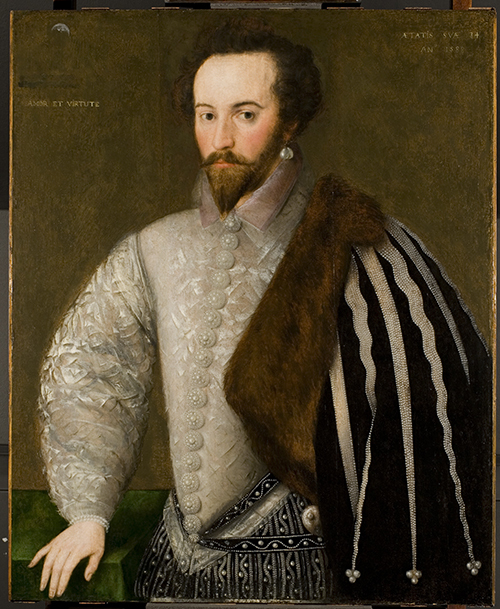 Last but not least, Sir Walter Ralegh is here, in 1588 at the very height of his power and influence. 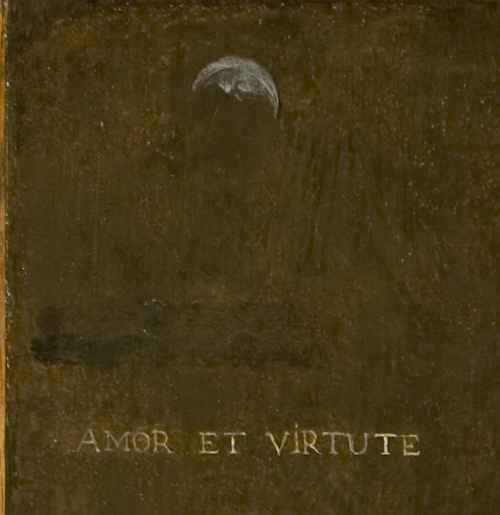 The gallery’s restorers have revealed a hidden detail in the portrait: a sea beneath the sway of the moon. It was a trope Ralegh used often in describing his own, often tempestuous, relationship with Elizabeth and here it affirms his subjection to her. He looks, if truth be told, exhausted. And perhaps he was. The tumults of the Tudor era took their toll on winners and losers alike. Elizabeth I and Her People runs until 5 January 2014. Tickets £13.50 (incl. Gift Aid). Concessions, half price Art Pass. 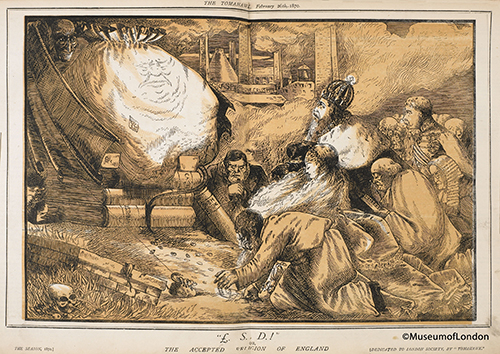 In June 1912, workmen digging under the former premises of a goldsmith in the City’s once-fashionable shopping thoroughfare of Cheapside discovered a sensational stash of treasure. It comprised over 500 pieces of precious jewels and stones, mainly from the late 16th to early 17th centuries, but some very much older pieces too. The objects were encrusted in the raw mud and clay. The excited diggers took their haul directly to the antiques dealer GF “Stoney Jack” Lawrence at his shop in Wandsworth. Stoney Jack was known to every navvy, builder and mudlark in London as the man who would know what to do with your find and give you a good deal. From there the collection found itself split between the Guildhall Museum (1826) and the London Museum (1912), but reunited when those institutions joined together as Museum of London (1976). 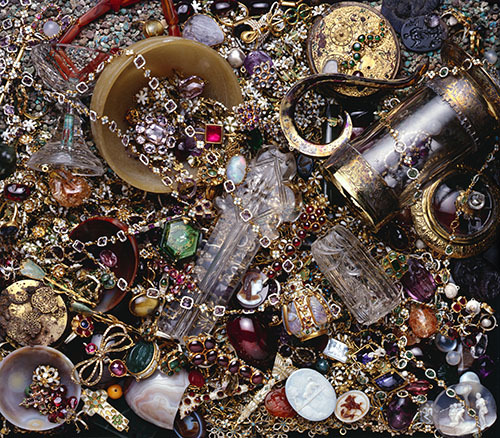 Amazingly, the Cheapside Hoard as it became known, has never been exhibited in its entirety. Until now. This new show at the Museum of London displays the hoard in all its glory. All bags to be left in the lockers downstairs, you have to pass security guards and specially-installed thick barred high specification floor-to-ceiling turnstiles before entering the dimly lit exhibition space. Once inside, you encounter dozens of glass cabinets in which curator Hazel Forsyth and her team have lovingly arranged the long-lost treasure. Rings, necklaces, brooches, earrings, bracelets, costume jewellery, perfume bottles, scientific instruments, watches, hairpieces, combs, lockets, cameos and on and on. I used to drool over this sort of thing as a boy reading pirate comics. What immediately strikes one is the design and the craftsmanship that went into these items. On display are some contemporary design books, works of art in their own right. 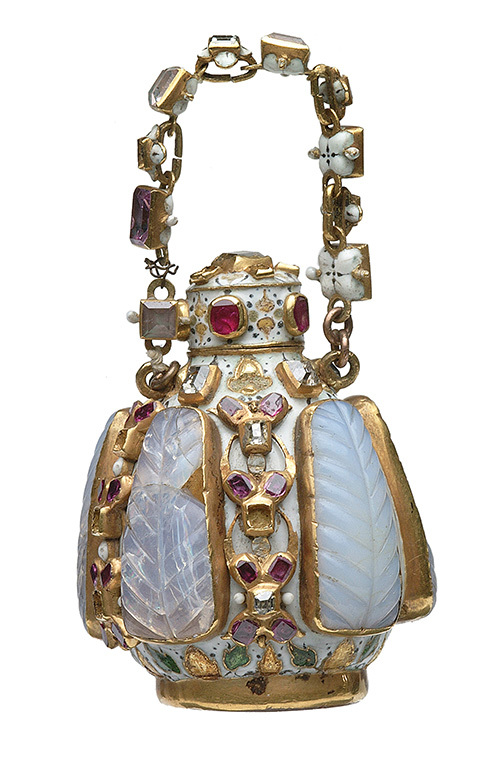 But it is the skill that went into the build of this jewellery that is breathtaking (there are large magnifying glasses on hand, for the use of) – these Tudor and Jacobean jewellers must’ve ruined their eyesight over the years. 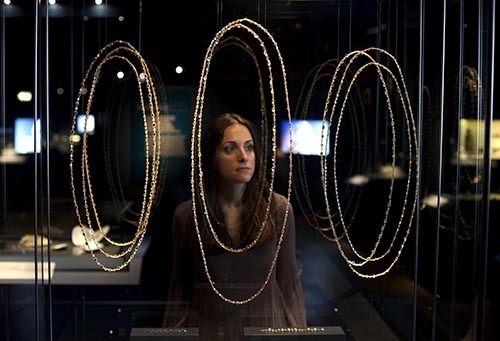 Museum of London staff had painstakingly to thread fine wire through each link of these necklaces to make this stunning display. The oldest piece. 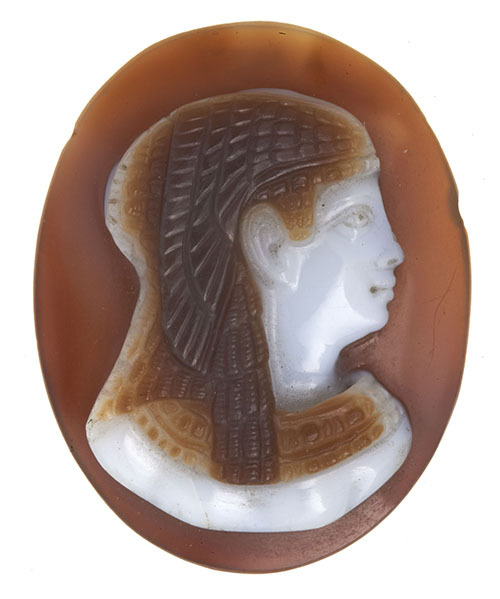 Ptolomaic cameo, possibly of Cleopatra. Gold and enamel scent bottle. Use of perfumes made a comeback during the Tudor period. An assortment of gorgeous pendants. 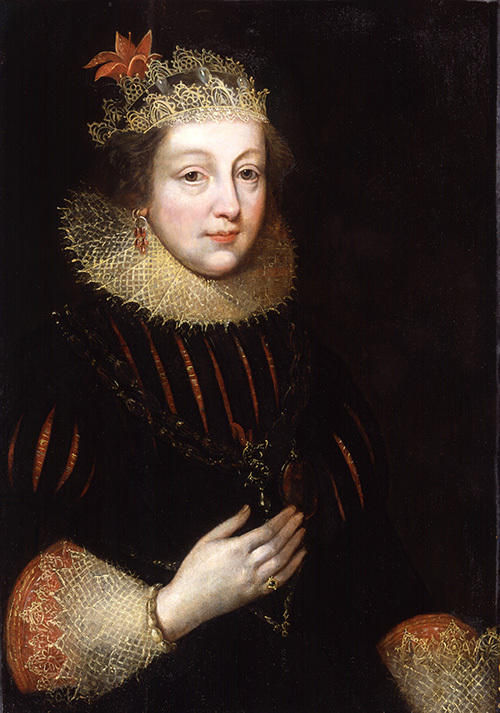 Elizabeth Wrothesley, Countess of Southampton, 1620. National Portrait Gallery. The fascinating thing about the hoard is that it tells us a lot, and yet it holds deep secrets too. Jewellery tends to be messed about over time. Fashions change, tastes change and so a lot of pieces get broken up, adjusted, reset, made into something else and so on. The jewels represent therefore a massive survival for jewellery and fashion historians to learn from. 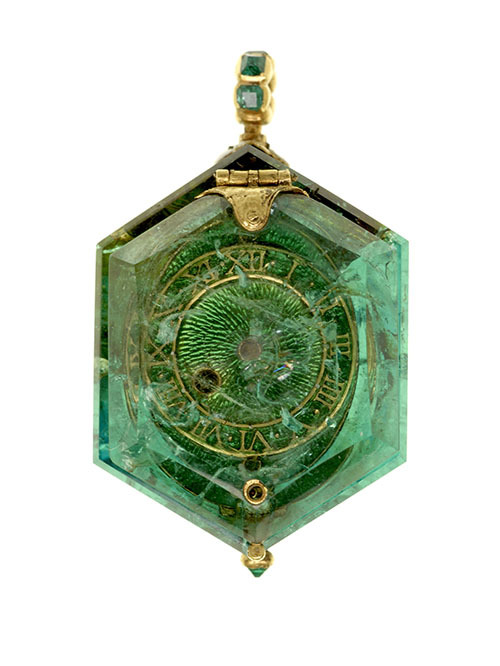 Second, a huge proportion of the precious stones are from the New World, particularly striking are emeralds from South America, reminding us how the maritime powers of Europe were dicing for global supremacy across the high seas, Elizabethan England not least of them, taking early steps on the road to becoming in time the number one player. Watch set in South American emerald. Amazingly, the translucent lid is actually closed! Having recovered from the sensory assault dished out by the jewels themselves, one has time to take in the support displays which put the whole thing in historical context and the curators have done a fantastic job. Contemporary portraits of England’s elite hanging on the outer exhibition wall, showing of their bling. Puritanism still being in its infancy, this was a period was of ostentatious display among England’s ruling elite. Status symbols. We have a section showing what contemporary Cheapside looked like through maps and illustrations. It was London’s leading thoroughfare of posh retail, dominated by goldsmiths, silversmiths, jewellers. 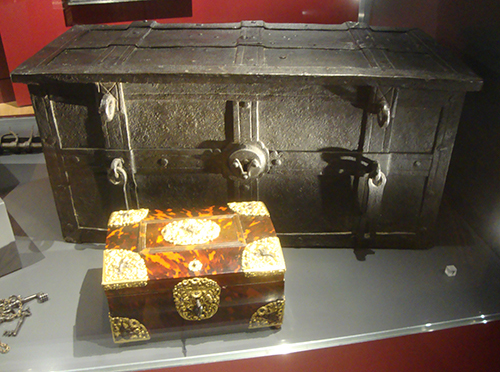 Another cabinet (my favourite after the jewels themselves) tells us about security, showing containers ranging from fancy jewellery cases through to ponderous iron-clad chests, secured by the most unimaginably complex locking mechanisms. 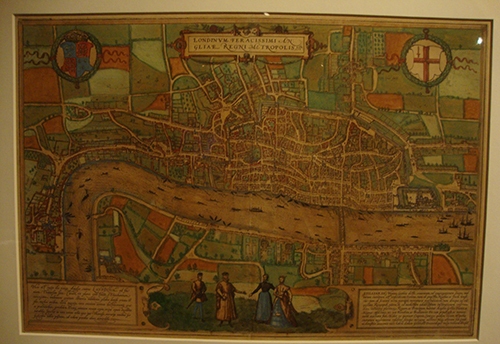 Braun and Hogenberg map of London, 1574. Pic: author. 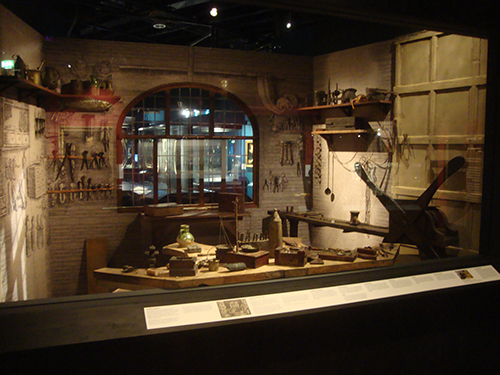 Reconstruction of contemporary jeweller’s workshop using actual tools from Museum of London collections. Pic: author. Treasure containers. The fancy and the cautious. Pic: author. Ephemera. One of several typical shop signs from the era. Delightful. Pic: author. So the hoard has told us much. But not its biggest secrets. Who owned it and why did they bury it? When did they bury it? And why didn’t they come back for it? The when has kind of been established. No earlier than 1640, because the newest piece has been successfully dated to that year. No later than 1666, the Great Fire, because the building under which the hoard was buried was destroyed in the Fire. As for the who and the why, there’s a short film clip at the end which throws up some possibilities. The English Civil war kicked off in 1642 and even after the Restoration in 1660, England was beset by religious and political uncertainty and strife. So they were dangerous times. In all likelihood the person who did the burying died and his secret died with him. But why did he do it, whose “side” he was on – religiously or politically? Who was he? We’ll almost certainly never know. 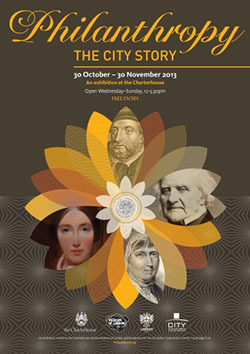 This is a landmark exhibition, wonderfully conceived and executed. highly recommended. 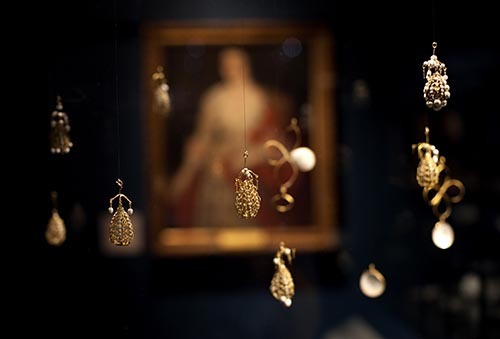 The Cheapside Hoard: London’s Lost Jewels runs until 27 April 2014. All images Museum of London unless otherwise stated. If this were a novel by Dickens or Thackeray, you may well nod approvingly at exaggeration for effect. But this book is a morality tale which is all true. The principals are the upright William Jackson Senior and his wastrel son, William Jackson Junior. Other leading characters include the boy’s long-suffering, loving mother, and other intimates who mainly comprise fond uncles, in-laws, servants and sundry accomplices. The whole story runs to the late 1820s but he main action takes place from 1807 and 1814. 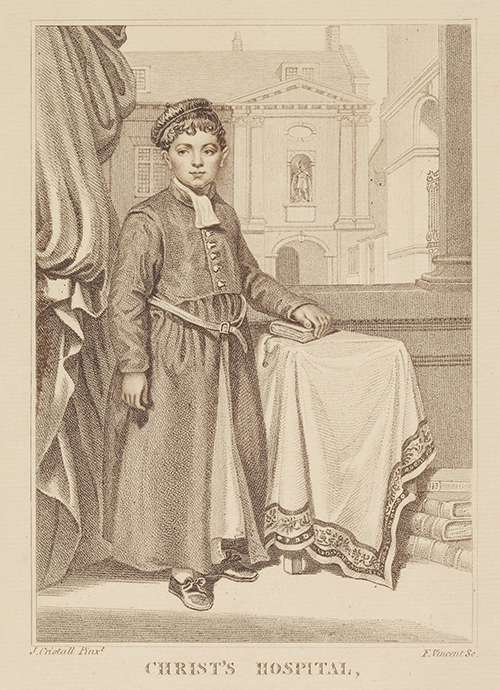 Jackson père had made a modest fortune as so many before and after him as an employee of the East India Company, in his case as a Collector in the Madras presidency. He blotted his copybook somewhat through the mishandling of an incident involving a recalcitrant local prince. It took him years back in London to restore his reputation. Choosing not to return to India, Jackson instead opted to go into semi-retirement as a pillar of the London middle-class and country squire, putting all his hopes in the assumed future achievements of young William, his only surviving child. He deemed the Law was the best option for the young chap. Unfortunately, young William had other ideas turning out to be the epitome of the dissolute, Regency wastrel, a Beau Brummel in miniature. He had vague ideas of soldiering, a romantic enough notion given the period. Sent away to be educated in the classics, he was from the start completely out-of-control. By his mid-teens he had been expelled from several schools, fought a duel, contracted venereal disease and swindled dozens of shopkeepers, landlords and sundry suppliers around town. Dressed to the nines and with a handsome prostitute on his arm, page after jaw-dropping page, William descends further and relentlessly into criminality. Nobody – parents, teachers, the military, the courts – can curb his excesses. Everyone loves a naughty anti-hero, but William is shocking. In total contrast, his father is a dull, upright, moralistic fellow, but one cannot help feeling for the man. The primary source for this entertaining book is Jackson Senior’s detailed but unpublished account of his son’s every action and his own response to it. 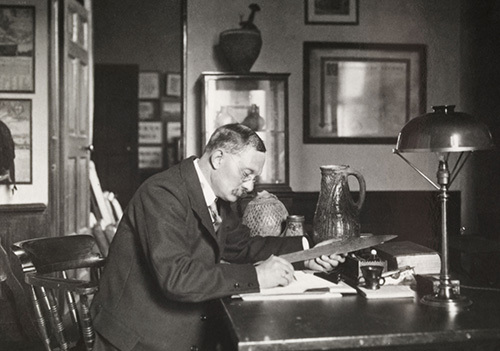 Filial Ingratitude was written in three volumes and in addition to its author’s account included meticulously copied correspondence between the main parties and much commentary, margin notes and so on. To him, reputation counted for everything; it seems he felt that getting everything down on paper protected him somehow. Nicola Philips takes the Jackson story and places it in the broader environment they inhabit, making us familiar not just with London’s streets but with the city’s major London criminal justice institutions. Bow Street, Marlborough Street, and Old Bailey. The prisons of Newgate, the Fleet and Clerkenwell. The hulks at Woolwich, and indeed lock-ups and courts further afield, but at the risk of spoilers, I shall leave it at that. Our period is during the Napoleonic Wars when specie was in very short supply. Much of the economy ran on bills of exchange, promissory notes etc. The system relied totally on men’s reputation and their word, otherwise the whole economy would come crashing down. And no formal police force! This created a perfect hunting ground for gentlemen swindlers and fraudsters of young William Jackson’s ilk. It is extraordinary too, just how sophisticated, intricate and extensive were social and business networks during the period. The reader – no less than Jackson senior – is left astounded at which hapless members of his family’s network the young Jackson was prepared callously to exploit, using all the low cunning of the amoral desperado. He was always one step ahead of his astonished and fuming parent, but in the end within the grasp of certain creditors – and the law. Ultimately the father, and then the obedient mother, withdraws protection and all support, leaving the profligate son completely exposed. The story by no means ends there but you’ll have to buy the book to find out. Even though we only really get the father’s side of the story, and taken that the louche Regency dandy fraudster was a far from uncommon type during our period, I found it very difficult to sympathise with William Jackson the younger. Except maybe a tiny bit at the end. A true Regency tale, with dollops of absorbing social, legal and criminal history thrown in, beautifully told. 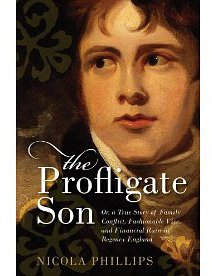 The Profligate Son (332 pp) by Nicola Phillips is published by OUP on 24 October with a cover price of £20.00, although available for less.